The global swine feed market was worth US$ 114.9 Billion in 2018. Swine feed is made with natural corn, soybean and wheat-based ingredients. It is also fortified with amino acids, essential fatty acids, vitamins and minerals to meet the nutrient requirements of pigs. A variety of pellet and mash swine feeds are available in the market which are formulated to improve performance goals and herd health. Apart from this, several varieties of swine feed comprise of proteins that are made with all-natural plant sources and natural fungal-based enzymes which aid in the break-down of different components of the feed during digestion. In addition to this, manufacturers are regularly testing new ingredients and feed formulas to produce innovative and efficient swine feed variants. The rising demand for pig meat across the world, currently represents an important factor driving the sales of swine feed. The increasing concerns regarding food safety have created a demand for high-quality swine feed to ensure meat safety. Another factor that is stimulating the growth of the swine feed market is the rising awareness about the importance of maintaining a healthy pig diet amongst farm owners. In accordance with this, they are shifting from regular swine feed to functional and premium variants that help in improving the immunity of the animals against enzootic diseases as well as reducing the risk of metabolic disorders, acidosis, injuries and infections. 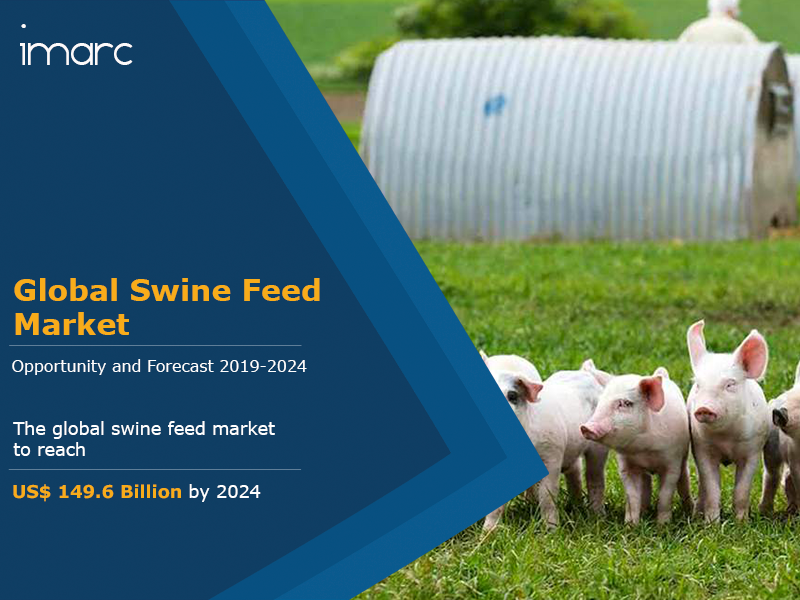 Furthermore, an increase in the demand for organic pig meat from consumers in the developed nations, along with the introduction of new animal rearing practices and maintenance of high farming standards, has created a positive outlook for the global swine feed market. On account of these factors, the market value is projected to exceed US$ 149.6 Billion by 2024, exhibiting a CAGR of around 4% during 2019-2024. Based on the product type, the market has been segmented into grower, starter, sow and others. The grower segment currently represents the biggest segment. Based on the feed essence, the market has been segmented into vitamins, antioxidants, feed acidifiers, antibiotics, feed enzymes, amino acids and others. Based on the feed additive type, the market has been segmented into zootechnical feed additives, sensory feed additives and nutritional feed additives. On a geographical front, the market has been categorized into Asia Pacific, Europe, North America, Middle East and Africa, and Latin America. Amongst these, Asia Pacific is the biggest market for swine feed, accounting for the majority of the global share. The competitive landscape of the market has also been examined with some of the key players being Chr Hansen, Royal DSM Holdings Limited, Lallemand Inc., BASF Limited, Novus International Inc., Kent foods, Archer Daniels Midland Company, Cargill Inc., ABF Plc. and Alltech Inc.
How has the global swine feed market performed so far and how will it perform in the coming years? What are the key regional markets in the global swine feed industry? What is the breakup of the global swine feed market on the basis of product type? What is the breakup of the global swine feed market on the basis of feed essence? What is the breakup of the global swine feed market on the basis of feed additive type? What are the various stages in the value chain of the global swine feed market? What are the key driving factors and challenges in the global swine feed market? What is the structure of the global swine feed market and who are the key players? What is the degree of competition in the global swine feed market? How is swine feed manufactured? IMARC offers market research reports and consulting services to clients consisting of, but not limited to, SMEs and Fortune 500 companies. Our team of skilled analysts focuses on understanding the requirements of our clients so as to provide insights best suited to their unique needs. © 2019 IMARC Services Private Limited. All Rights Reserved.